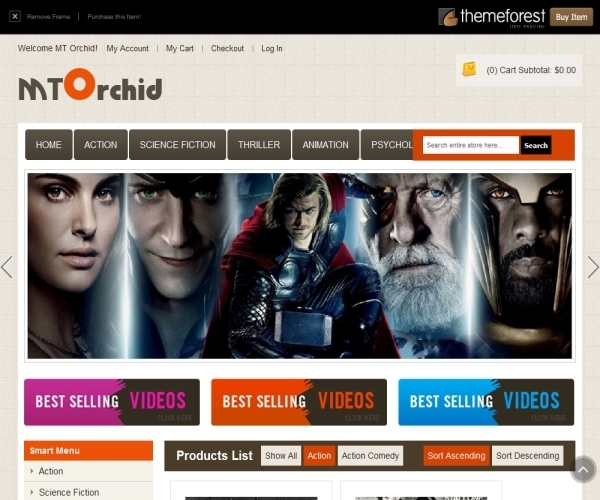 MT Orchid is a responsive Magento theme featured at ThemeForest.net and suits online movie sites where you can sell physical copies of your collections as well as digital downloads. The theme can be viewed from smartphones, tablets as well as normal desktop viewing resolutions. A single page checkout extension allows users to complete the checkout process within a single page. The theme also integrates with Google fonts giving you extensive font options to choose from. The homepage comes with elegantly designed boxed layout which includes a full-width image slider for your featured images. A tabbed product grid allows users to select the product category as well as sort the products. The theme also comes with an opt-in box in the footer for users to subscribe to your newsletter.The theme is built on the latest 100% Tableless design scheme and is cross-browser compatible. A built-in contact form allows users to send a direct message. An About Us page help you easily upload your custom content in the site. You can also include a user poll within the homepage. The theme comes with a keyword search box in the header from which users can do a quick search. An Advanced Search page helps users search with multiple attributes. Internal product pages come with a Lightbox gallery which can include multiple product images. You can also add reviews, allow users to submit reviews and product tags. The tabbed content extension allows you to add multiple content blocks within the same space. Also included is a Related Products extension which would automatically populate similar products as per the current selection. The theme also allows users to register within the site and manage their stored information. They can compare products, write reviews and can also create a custom wishlist of products. The MT Orchid premium Magento theme is priced at $75 and comes with included PSD files.